The new advertising campaign for Nikon COOLPIX and the D60 D-SLR featuring Ashton Kutcher includes your chance to win a new Nikon D60. Sixty D60 kits will be awarded as First Prizes and the Grand Prize winner earns a trip for two to Los Angeles to attend The Hollywood Style Awards. The awards, sponsored by Nikon, will be held on Sunday, October 12, 2008. Details on the "Moving Moments" contest are available at www.ashtonsd60.com. According to a Nikon USA press release the theme of the contest submissions will cover a wide range of both emotionally captivating and action shots. The images can be captured by any brand of camera. The 60 First Place camera kits will include a Nikon D60 camera body, AF-S DX NIKKOR 18-55mm f/3.5-5.6G VR (Vibration Reduction) Image Stabilization Lens, Rechargeable Battery, Charger, USB Cable, and Software Suite CD-ROM. According to the official rules posted by Nikon, the contest is open to residents of the 50 United States and the District of Columbia who are at least 18 years old at the time of entry. Contest submissions need to be uploaded before midnight (Eastern Time) on June 20, 2008. When you win, make sure you let us know (so we can share the good news). Don't forget to sign up for the Nikonians Academy Advanced Digital ImagingWorkflow workshop June 12-15 in Dallas, Texas, where Jason and Rick will be guest instructors! The Nikonian's Martin Joergensen was having all kinds of gear trouble, forgetting things at home, having the D200 fail and facing various wet hazards while shooting during a fishing trip in Ireland. Samples of the Ireland shots - both some of the good ones and some of the ones that didn't work out due to the gear trouble. Nikonians wishing to know more about the ground-breaking Scene Recognition System (SRS), first introduced in the Nikon D3 and D300 Digital SLRs, will want to read this interview with designer Hiroshi Takeuchi. "Until now, we have been improving AE, AF, and AWB technologies independently, but when these technologies matured, there was no technology capable of linking them. The Scene Recognition System is thus a core technology that links the superior aspects of these three technologies. D3 wins the 2008 Camera Grand Prix. Noted threads to look for are: "Do you take breaks from photography" and "Cell Wars: Nikon or Canon". Nikon Engineering has long traditions of producing the best technology there is. Check out this Nikon Imaging article featuring team lead Mr. Hiroshi Takeuchi, responsible for the development of the Scene Recognition System incorporated in the Nikon D3 and D300 to learn more about the technology. 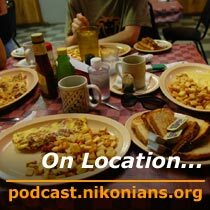 Nikonians (www.nikonians.org) has started a new section in French for all French speaking Nikon Users. Lowepro has released two new bags in their all-weather (AW) line - the Inverse AW beltpack, which features a 360-degree swivel harness and the more traditional Nova AW shoulder bag, which comes in six sizes to accommodate photographers of all skills and interests. More kudos for the Nikon D3; hot on the heels of the TIPA awards, Japan Press Club has named the full-frame Digital SLR their choice as Camera of the the Year in the 2008 Camera Grand Prix. Nikon beat out over 170 competitors to land the distinguished rating. Tamron has published release dates for some of their highly anticipated lenses. The 70-200mm f2.8 Di, the 28-300mm XR Di with Vibration-Compensation (VC) and a new version of the 28-75mm f2.8 XR Di now sport built-in AF motors for compatibility with Nikon cameras like the D40 and D60; all three are scheduled to be available on store shelves in Japan on 30-May 2008. Global distribution is expected to follow shortly thereafter. The Copenhagen Marathon was run on a beautiful day with perfect weather for the runners and almost perfect weather for shooting photos. 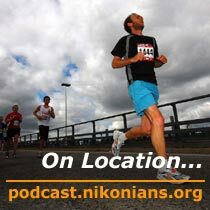 The podcast talks about shooting running people, using flash in daylight and assorted other subjects. A bunch of pictures from the Copenhagen Marathon with comments. Notice the new full screen mode on the slideshow. 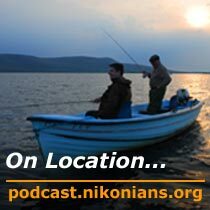 Click here to download Nikonians On Location Podcast #17 (NPC-OL-2008-05-12; 13:58; 6.5MB, MP3 format). Video supplement available here (NPC-OLV-2008-05-12; 8:35; flash format). A few tips on shooting when access to your subject is difficult because of a crowd. Also some tips on the use of flash in daylight when the light is harsh and there is lots of shadow alternating with bright light. Color, faces, crowds, music. A carnival parade has it all. See the slide supplement to "On Location #17, Carnival Parade" here. With apologies, NewsFlash will take a brief hiatus and will return on May 25th! 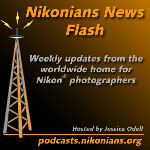 In the meantime, feel free to email Jessica at newsflash@nikonians.org with any questions, comments or announcements! Imagine being able to control color and brightness selectively in Adobe Photoshop and Apple Aperture, without having to use masking techniques. With Nik Software's Viveza, you don't have to imagine any longer. Utilizing Nik's popular U-Point control technology, you can select any point within a photo an manipulate an object's color, contrast or brightness in a fraction of the time it would take using more traditional techniques. Viveza is available now for Windows or Macintosh platforms. Nikonians help you simplify, and to understand your digital workflow in detail, no matter software or hardware used. More at the Nikonians Academy. SkyTop Trading has a very unique and stylish option for Nikonians who like to "quick-draw" their digital SLRs. Caution: these carry bags will definitely get attention, including that of law-enforcement - at least at the first glance. (Thanks to member Scott Chapin for this find). We, the largest Nikon User Community (www.nikonians.org) are looking for volunteers for the largest imaging exhibition there is. If you want to participate, check this out. Shooting while traveling. What I bring, how I do my image household and a few tips. 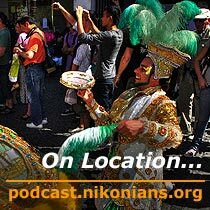 Click here to download Nikonians On Location Podcast #16 (NPC-OL-2008-05-05; 18:46; 8.8MB, MP3 format). Video supplement available here (NPC-OLV-2008-05-05; 11:36; flash format). A podcast gathering some thoughts from a newly ended two-week trip to Florida. It's not shot on location as such, but just captures some thoughts on traveling and shooting. Some sample shots from Martin's trip to Florida. Just to give you an impression of his many pictures from the trip. The 8th anniversary electronic magazine (ezine) special issue of the The Nikonian in PDF format is available. Download your personal copy for free. Everyone had an incredible time and the resulting photographs were exceptional. In fact, take a look at the photos taken at the workshop here. This week, Winston Hall is running another travel workshop in Moab, Utah and we are hoping for the same successes! If this sounds like something you might be interested in, we have a number of additional travel workshops this year planned for Albuquerque NM, Tanzania Africa and Moab (again!). Better hurry though, these are all selling out. In fact, our travel photography workshop in Banff, Canada has been sold out for many months. You can check out our travel workshops at www.nikoniansacademy.com. We've been listening closely to your feedback and have added a number of Nikon Capture NX workshops all around the USA. Every week we receive numerous requests to bring back this very popular course, so we've added them to the schedule for the rest of 2008. Check out our new postings for Capture NX in Seattle, Minneapolis, Omaha, Raleigh, New York and Washington DC. Also, in response to the tremendous demand for the Nikon D300, we've added additional D300 workshops around the USA. Look for more of these in New York, Washington DC, Portland, San Diego, Seattle, Raleigh, Omaha, Minneapolis and Atlanta. Noted threads to look for are: "Is the Nikon D200 Obsolete" and "Anybody else tired of being your own lab?". Nikon has released the revised D3 firmware that addresses corruption generated by Version 1.10. The version 1.11 release is available for Windows and Macintosh platforms (Nikon USA links). This week, the Image Doctors offer a potpourri of topics, including fisheye lenses, the RGB histogram, and whether to choose a VR lens. 36:20 VR or not VR?